8 Alternative Ways to Cook without Power! 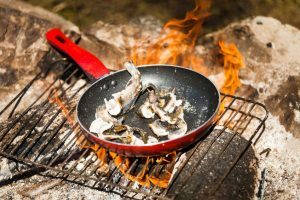 Whether stranded in the wilderness by accident, or relaxing at your campsite on a weekend getaway, hunger will come calling – and without traditional cooking instruments or appliances readily accessible, keeping your party fed means trying new methods of cooking. Don’t wait to experiment in the woods; review these tips for cooking your food outdoors to make sure you’re prepared for any situation. When you’re on the trail, packing light is the name of the game. 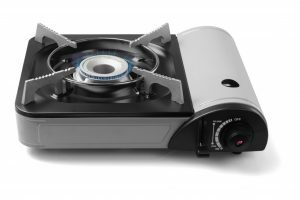 If you’re looking to take a stove with you, you can’t go wrong with a flat-folding steel stove. Its small dimensions make it easy to pack and transport, no matter where your outdoor adventures take you. Measuring 6×6 inches, this tiny stove packs a powerful punch—it’s strong enough to hold a heavy pot of water on top, which you can boil in under 30 minutes. Combine the folding stove with any canned fuel to reheat and cook foods in emergency situations. Looking for something a bit more powerful? Check out portable butane stoves. Combine these with relatively cheap butane canisters, and you can harness enough heat to mimic an electric stove. Whether you’re indoors or outdoors, these stoves are easy to use. Harness the power of the sun and turn solar rays into cooking power. A lightweight solar cooker is ideal for emergency bags and camping trips; it’s easy to use and quick to fold and store. For maximum effectiveness, you must be in a sunny climate with warm temperatures. If you’re headed out to a warm climate, this cooker will come in handy. It’s great in areas where open flames aren’t allowed, and can be used to cook food up to temperatures of 225 degrees Fahrenheit. Take it back to basics with open fire, perhaps the most obvious and simple cooking solution. Always come prepared with fire starting materials, whether it be tinder, matches, or dry wood. Be sure to practice fire safety by placing rocks around your fire to prevent spreading. Make it easy to cook over open fire with a basic fire grill—grill tops are lightweight and easy to pack and transport. Pans, pots, and skillets can then be rested safely over the heat. You can also cover your food with tin foil and place directly in the fire or on hot embers. This can be achieved effectively with a CanCooker, a large aluminum container that mimics a convection oven and steam cooks the ingredients inside. Make boiling water in the great outdoors easier than ever with the Kelly Kettle. This kettle can use any natural fuel and weighs less than two pounds. Simply start a mini fire in the base, set the water-filled kettle onto it, and drop additional fuel like leaves, paper, or grass down the chimney. 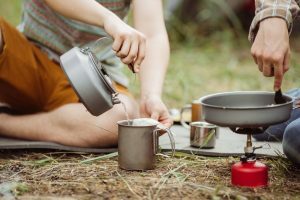 This is a basic camping requirement; boiling can purify dirty water, and help cook hot soups or meals for extra strength on the trail. Looking for something small and efficient? Rocket stoves burn small amounts of wood in a simple combustion chamber with an insulated vertical chimney. This ensures almost complete combustion before the flames reach the cooking surface. These stoves are ideal when fire starting supplies are hard to come by, and can be easily made out of tin cans for portability. Volcano stoves are quite possibly the most versatile of all emergency and powerless cooking options. They can be used with wood, charcoal, or propane, and fold down to five inches for easy transport, packing, and storage. Desperate times call for desperate measures, and your car can come through for you in many ways in an emergency situation. 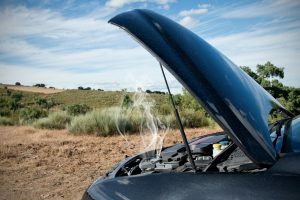 The heat from your car engine can serve as a reheating or cooking method—perhaps the most unique and outlandish cooking recommendation, but effective nonetheless. Simply heat up the car engine to the necessary temperature; once you hit it, turn the car off to save gas and power, and place foil covered food or a skillet on the engine. If you’re running low on gas, this isn’t a viable solution; if you have plenty to keep you going, car engine cooking could be the answer to your food woes. Before heading out to the great outdoors, and prior to emergencies, prepare for any and every outcome. Make sure to practice these alternative cooking methods, and follow all safety instructions to prevent any additional chaos. Bryan Koontz is Founder and CEO of Guidefitter, a platform for consumers looking for a hunting & fishing adventure with a professionally licensed guide or outfitter. The online community allows users to share their experiences and serves as a hub for sportspeople and outdoor adventurists. Bryan holds a BS in Engineering Mechanics from Penn State University and an MS in Mechanical Engineering from MIT.